Yes, I know it says Tweeter (I didn’t create it). But having the social info on table tents was progress! I’ve volunteered for my local United Way the last two years, but I’m not building houses, helping with community gardens or raising money. I’m using my social media marketing skills to help the agency with social media for their events. My role is to engage their audience of volunteers and supporters before, during and after events, including traditional save-the-date/registration, thanking volunteers when the work is done, and creating and sharing multimedia. Most of the work takes place during the event day – including live posting and working with a group of volunteer photographers who provide images and video content. 1. Create a content calendar – Meet with event organizers at least two months prior to your event to plan out your social media communications. Include save-the-date messages, registration reminders, linking to monthly newsletters, and highlighting sponsors and participating organizations. Balance your event content with your everyday content so you’re not just talking about the event all the time. 2. Meet with everyone who has access to the organization’s social media profiles – It’s important to review basic social media marketing best practices to prevent oversharing, to know who is posting what content, and to review social media etiquette (such as not liking your own posts). 3. Look before you post – If you are a Facebook admin, you will get alerts when a fan interacts with your page or content. You don’t get alerts if another admin has posted to the page. Even if you have planned your content with the other admins, someone will forget. Check the time and the date of the previous post to avoid oversharing. 4. Integrate your marketing – Remind event organizers to include links to the nonprofit’s social media sites on every communication that goes out about the event, and make sure you have a sentence or two that lets volunteers know that they can find event updates there during the event day. 5. Follow your supporters – It’s important to thank your supporters – those who gave money to your cause, as well as those who sent teams to participate in your event. Get a list of supporters before the event day. Make sure your nonprofit’s page likes their pages, and your Twitter account follows their accounts. When you thank them on Facebook or Twitter, tag them. They’ll be notified that someone’s talking about them, and any interaction they have with that content will be seen by their fans, and so on. 6. Encourage volunteers to participate – If your volunteers don’t know that you’ll be providing live updates throughout the day, they won’t know to check your Facebook page or tweet about the event. Let them know in your event communications. Tell them at the event kickoff. We have lots of younger volunteers at these events, so – at one point during event kickoffs – one of the organizers holds up their smartphone and tells volunteers it’s OK to use it. 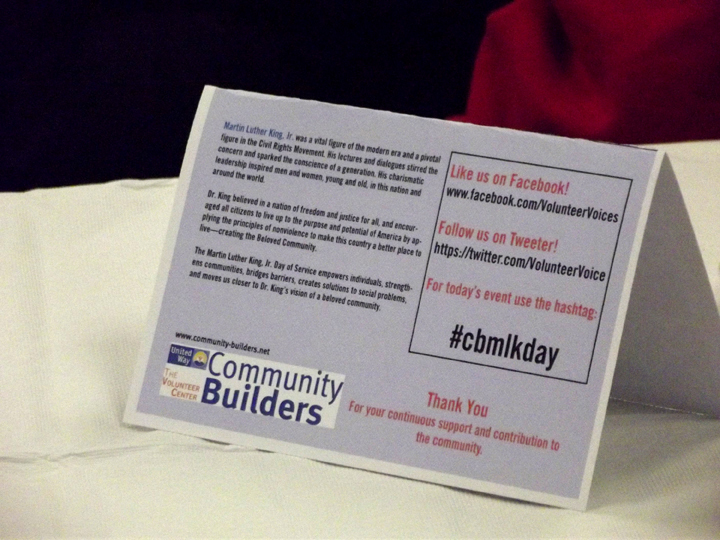 We usually create an event hashtag for Twitter, and we’ve been getting better about sharing it and the social media info during the kickoff –we had table tents with the Facebook URL, Twitter handle and Twitter hashtag on display at the Martin Luther King Jr. service day this month. Volunteers had plenty of time to pull out their smartphones and follow us as they were having breakfast. 7. Use Dropbox to gather multimedia –You’ve got multiple people who are shooting at multiple locations and are producing dozens of large image files. Dropbox is the easiest and best way for you to receive those images. Create a folder for the event and share it with your volunteers ahead of time. New Dropbox users have trouble navigating the site, so setting this up ahead of time and providing instructions for uploading photos will make it easy on your volunteers and yourself. 8. Minimize your uploads – During an event day, I’ll edit as many images as I can and post them all at once in a Facebook photo album around lunchtime to show fans the progress that’s being made. I’ll wait for more photos to come in, and then add the rest of the images that night or the next day in one bulk upload. By adding a ton of photos at once, that action appears once in the newsfeed and will keep me from oversharing. No butts – Volunteers who are working at the Day of Caring or the Martin Luther King Jr. service day are typically doing a lot of bending over – working in gardens, painting rooms, or hammering nails. So you’re going to get a lot of photos of butts unless you point this out to your photographers. I don’t know about you, but I really don’t want a photo of myself bending over to appear on Facebook. Ask your photographers to slow down, take their time and find a more flattering angle. Smiling and candid shots are great – These events are about working hard, but they’re also about teamwork and having fun. Encourage your photographers to get group shots at project sites. These are great images for nonprofits to add to their website, blog or promotional pieces about their programs. Ask for the top 10 – Save yourself and your photographers some time by asking them to send you the top 10 photos from each project site. It’s not realistic to use every image that was shot that day – no one wants to look through a Facebook album of 300 images to try to find themselves. 10. Wifi – Does the event site have wifi? If so, get the account name and password ahead of time. If not, consider purchasing a mifi/wifi card to create your own wireless hotspot. 11. Social apps – Are Facebook, Twitter, Instagram, HootSuite, or TweetDeck installed on your phone? Do it before the event day so you’re not trying to remember logins and passwords on the fly. 12. Electricity – Are there outlets on site, and are there enough? You might think about bringing an extension cord to support your laptop power source and any chargers you need. 13. Batteries – Are all batteries charged for digital cameras and video cameras? 14. Cell phone contacts – Add your event staff and volunteer photographers ahead of time so you’re not digging through notes or paper lists to find their contact info. 15. GPS – If you’re traveling to several project sites, consider using an app like Waze to get turn-by-turn directions. 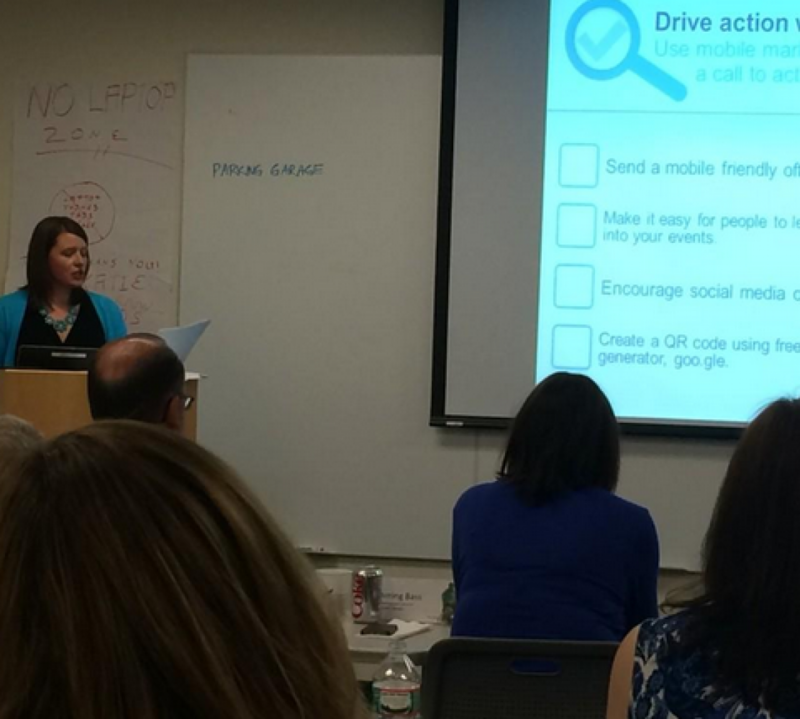 This is a long list, but it’s essential if you want to get the most out of social media for your nonprofit’s service days and events. If you can think of any other tips, please share them in the comments! I am so sorry for replying so late. I’ve been having issues with WordPress comments this month. I think one great place for you to start might be at a local college or university in their communications department or business school marketing department. I previously worked in higher education, and it’s pretty common for universities to have classes where projects are assigned to help a local organization. The students work as marketing consultants and help you develop a plan and content for your organization or event. Another place to go is your local United Way. It’s how I got started! Put the word out in a volunteer listing that you need help from someone with social media marketing skills. Some volunteers – like me – are terrible at things like landscaping and painting, but I’m happy to use my social media skills for free to help someone out. And as for which network to start with, I absolutely recommend Facebook, but make sure you are using a business page and not a profile. Facebook is the best to start with because of its size – 665 million daily active users – so chances are your potential audience is already there. Again – so sorry for the lateness in my reply. Good luck with your event!